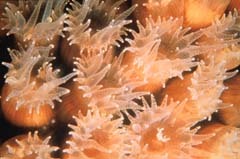 Most corals are made up of hundreds to hundreds of thousands of individual coral polyps like this one. The Coral Tutorial is an overview of the biology of and threats to coral reefs, as well as efforts being made to conserve and protect them. It includes images, animations, and videos. The Roadmap to Resources complements the tutorial. It directs you to specific online coral data and information from the National Ocean Service and NOAA.